The story of Margarete Steiff is filled with fairytale quality. Margarete contracted polio when she was just 18 months old, which meant that she would spend the rest of her life in a wheelchair. However, this spirited and courageous young lady took her life into her own hands - not allowing a disability to divert her. She learnt sewing and tailoring and soon became a very skilled seamstress. She started up her own small business, initially making ladies' and children's clothes. Little did she know, when she was working on a little fabric elephant to be used as a pincushion, that she was laying the foundation stone for the international company of the future - Margarete Steiff GmbH. Richard Steiff, nephew to Margarete, joined his aunt's company in 1897. He was to become, after his aunt, the second most influential figure in the Toy Industry and the most important figure in the history of the Teddy bear. In 1902 Richard Steiff designed the very first jointed Teddy bear, a bear gifted with movement and a bear that would take the world by storm. Thus, the company name became synonymous with high-quality soft toy animals the world over. Founded in 1880, Margarete Steiff GmbH has pursued excellence with determination, fuelled by their guiding principle "Only the best is good enough for our children". From humble beginnings the enterprise blossomed into the world's most famous soft toy company. Today the company embraces its history, and in doing so embraces innovation, imagination and perfection. Proud of our heritage yet forward-looking and venturesome, Steiff never stops chasing dreams. The company's extraordinary and unequalled ability in bringing comfort and companionship to millions provides the perfect reason to celebrate a million occasions. 100 years of "Button in Ear"
To protect Steiff products from imitation and plagiarism, Franz Steiff, Margarete's nephew, invented the legendary "Button in Ear" in 1904, one of the first trademarks of the 20th century. Since 1 November 1904, therefore, every Steiff animal has sported the characteristic button in the left ear, which makes the products unmistakeable and unique. To prevent imitation, the term "Button in Ear" was also registered as an official trademark on 20 December 1904, and was given legal protection on 13 May 1905. Thanks to this brilliant idea of Franz Steiff's, the Steiff "Button in Ear" brand has developed to become one of the world's oldest and most well-known brands. To pay homage to the 100th anniversary of the Steiff "Button in Ear" brand, a special collection of four Teddy bears is available - but only until the end of 2004. Each of these valuable bears sports a specific feature, an imitation of the original elephant button from 1904, in its left ear! 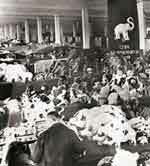 In 1902, Steiff invented the Teddy bear and presented him to the public at the Leipzig Trade Fair in 1903. It didn't take long for the Steiff Teddy bear to become most children's favorite toy and many adults fell in love with it, too. With this tremendous success, many competitors started to copy Steiff products. Consequently, Steiff had to find a way to distinguish their creations from its competitors. There was a general agreement that a company trademark was needed, that had to be permanently attached to the products. Up until this point in time little cardboard tags were used, fastened to the body or the clothing of animals and dolls showing an elephant with a trunk raised in the shape of an "S" for Steiff. As these labels could be torn off without difficulty, Franz Steiff, one of Margarete Steiff's nephews, wanted a more permanent trademark and invented the "Button in Ear". After several alternatives had been tested, a metal button embossed with the elephant having an S-shaped trunk was finally chosen and attached to the left ear of every product. 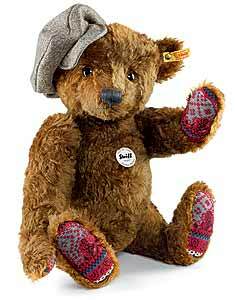 The new trademark was born and the "Button in Ear" has been firmly fixed to all Steiff products since November 1, 1904. An application for registration of the "Button in Ear" trademark was submitted on December 20, 1904 and the registration was confirmed in writing on May 13, 1905. The metal button with the elephant design was only used in 1904 and 1905 and was thereafter replaced by blank buttons and buttons with the word "Steiff". As the elephant button was in use for such a short time only, items bearing this trademark are considered a great rarity today.